When you hear the word platinum, you think of top quality. This pure, white precious metal is perfect for fine jewelry for both practical and aesthetic reasons. Platinum wedding rings hold their value and stand up to hard use in daily wear. It is rare, doesn’t tarnish, and is gentle on the skin. Because of its natural white color, platinum wedding rings do not change the color of diamonds as yellow gold can. Platinum is much more durable than gold, keeping its color over time instead of fading or tarnishing as some other metals do. Unlike gold, which is only 75% pure in its 18 karat form, platinum is 90 to 95% pure. This high level of purity makes platinum a great choice for anyone with skin problems because it is naturally hypoallergenic and will not color the skin. Platinum is also used in the medical and automotive industries, where the precious metal’s non-corrosive properties make it useful as a component of heart pacemakers and catalytic converters. Jewelers did not begin to work regularly with platinum until the late 19th century. It was at this time that the acetylene torch was invented, which allowed the extremely durable metal to be shaped. Louis Cartier was the first jeweler to successfully craft platinum wedding rings set with diamonds. Platinum is 30 times more rare than gold, and found in very few places throughout the world. Most platinum comes from South Africa, but some has been found in Russia and Canada, as well. Because of its rarity, platinum is more expensive than other precious metals, but it also holds its value better. Platinum wedding rings are more expensive than gold rings, but they are a good investment. Platinum is famous for its durability. Platinum wedding rings are a popular choice for men because they stand up to daily wear and tear so well. Yellow and white gold can lose their shape and be damaged by activities such as manual labor, yard work, sports, working out or tinkering with cars. While platinum can be scratched, it takes much more force, and damage to platinum wedding rings is unusual. Juno Jewelry has many stunning platinum wedding rings for men and women, as well as eternity rings set with diamonds and other stones. Our in-house artisans craft each piece, and any of our designs can be made from platinum instead of gold. All of our jewelry comes with a lifetime guarantee and is covered by a 30-day return policy. 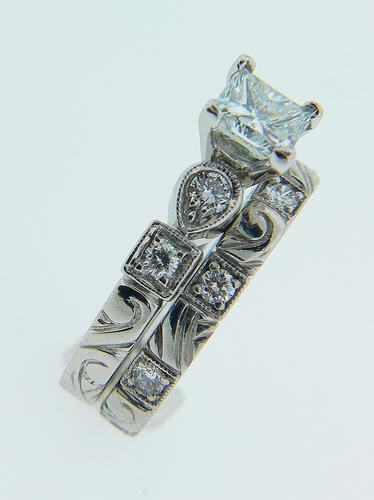 Turn to Juno Jewelry for platinum wedding rings that will be as eternal as your love.